I like the look of decorating with vintage suitcases, but I never find reasonably clean and non-smelly ones at a good price. I was lucky to get not one, but two, old suitcases from my neighbors when they sold their house. This yellow one with burgundy leather trim is from Paul Bunyan Luggage. It has some marks and wear from use, but it's clean inside. 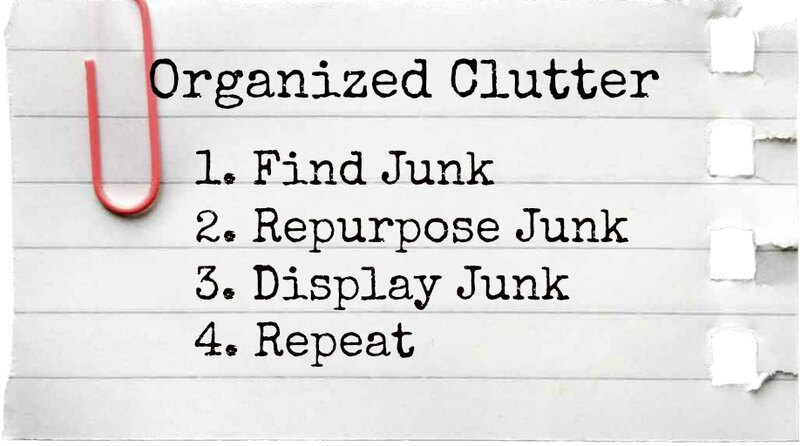 And, the suitcase wasn't empty either! It had this Headlight Union Made striped work shirt inside from the 1960's. Also a pair of size 9 Spalding vintage golf galoshes. I had never seen a pair of golf galoshes before this. 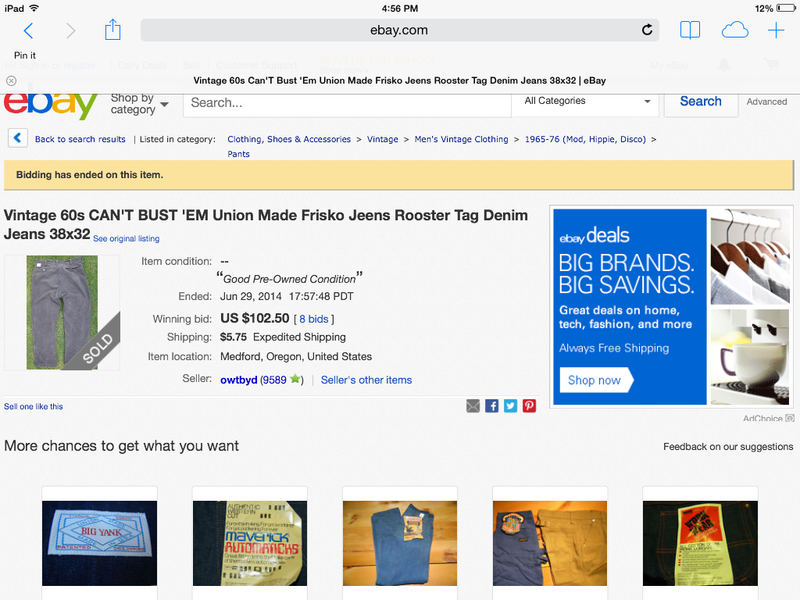 Also a couple pair of Frisko Jeens rooster label "Can't Bust 'EM" black work pants. An Arrow Decton Batiste shirt still in the package and priced at $5. Maybe these items don't seem all that special... BUT, after checking ebay for vintage work clothes, I found this completed auction. $102.50 on June 29, 2014. I hope this happens for me because I just listed a pair!!!!!!! It's not the same size, however. Not sure if people buy these to collect or wear. 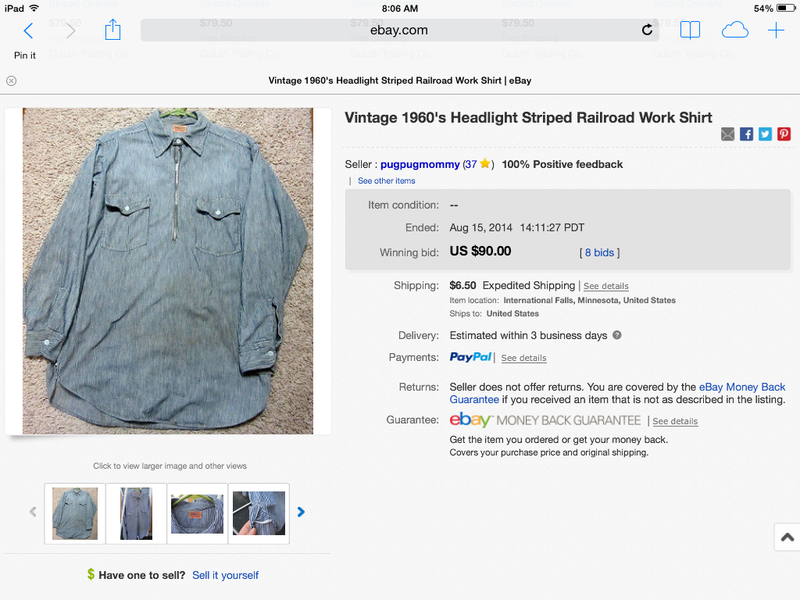 I also listed the striped shirt after seeing some fairly high prices on Headlight work clothing. It seemed that some stains and even wear were allowed on vintage workwear. I will let you know how my auction goes next week. Or you can watch too for the shirt here and the work pants here. The other suitcase from the neighbors had some cool stuff in it too. I will share that with you soon! *****My Ebay auctions are finished, and I am happy to report that I sold the work shirt for $90. The Frisko jeans sold for $19.99 and the golf galoshes did not sell. Still a great find in an old suitcase! What??? I can't believe that! I do love the suitcase. I found two red ones I posted about awhile back. They both smelled ladies' lavender powder and were beautiful. Well I don't know about the clothes... but I love the suitcase! Carlene, I have a vague memory of black Frisko Jeens from my early childhood, but I can't remember who wore them. I'd forgotten all about them. I think I'm going to have a lot of fun looking at all your finds! Isn't it amazing what people buy and how much they pay for it! Looks like you got a good deal with that suitcase. Good luck on selling the clothes for a good price.